Read and match, this activity is suitable for level II and III students, as soon as they have been introduced to the vocabulary for genres of TV and film. 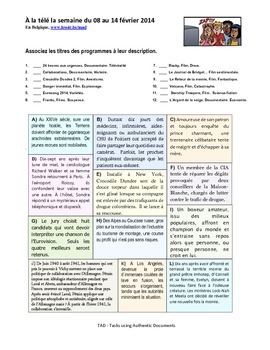 Pulled from the French TV guide, these authentic summaries of different shows/films will intrigue your students as they match the names to the shows' summary. Level - CEFR A2 and B1.